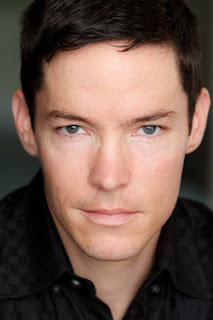 Seattle-based actor David S. Hogan has a unique role in The Barber of Seville. As Ambrogio, Dr. Bartolo’s servant, Hogan doesn’t sing or speak any lines, but he’s very much a part of the action—and the comedy. Today we chat with Hogan about what it’s like to be transformed from a handsome young guy into a crotchety old man, and how he manages to land those pratfalls without getting too injured. This is your mainstage debut with Seattle Opera, but you’ve been in a Young Artists Program production with Peter Kazaras before. How did your relationship with the Opera begin? I was in the YAP production of Britten's A Midsummer Night's Dream, and I played Puck, the only speaking role in the opera. I am pretty certain that Vanessa Miller, who has an affiliation with Seattle Opera, passed my name along to the "right people." I had recently been in her production of Shakespeare's Midsummer with Seattle Shakespeare Company, so, I presume, passing along my named seemed like a good idea—which it was! At least in my opinion, because here we are now. You have plenty of experience on the stage, but have your two productions with Seattle Opera been your only operatic engagements? Obviously, the giant singing makes an opera different from a play, but have you found any other differences between the two? Oh, yes, these have been my only two experiences in the opera—but, I hope, not my last! I have performed in one musical, and about 30 "straight" plays. I think that, yes, singing aside, it is similar. Of course, I have to act within the confines of the score when I do speak. In Midsummer, for instance, where I had quite a bit of text, I had to say the lines within the score. I was working inside or with music. Overall, in opera, as in theater, I believe we face the same responsibilities: interpret the text, discover the playwright's (or librettist's) intention, serve the story, listen to our scene partners, and collaborate with directors. Sally Wolf (Berta) and David S. Hogan (Ambrogio), in mid-fall, during The Barber of Seville. There’s a lot of physical comedy in this Barber, especially with your character. Doesn’t it hurt to smash to the floor like you do? Ha! Yes, we all know people who fall down are funny, so I was happy to practice and perform falling to the floor as quickly as possible for a few laughs. Sure, it hurts. But only a little! I have a few bruises, but I know a few tricks and I am pretty sturdy. Funny enough, I have had a few opera-goers tell me that I should teach falling (or, rather, landing) classes, so people who do have accidents can bounce right back up, like Ambrogio does! On a serious note, it is very important to do stunts safely. When I rehearsed the rail slide, I realized that the more I slid, the faster the ride became. That is why (spoiler alert!) I wear gloves in the scene—so I can slow down! I have done some training, locally, working with great people like Geoff Alm, Peter Dylan O'Connor, and Deb Fialkow. The training (don't break your falls with your wrists, land on your body's padded areas) and practice helps, but a lot of what I do with my body is instinctual. 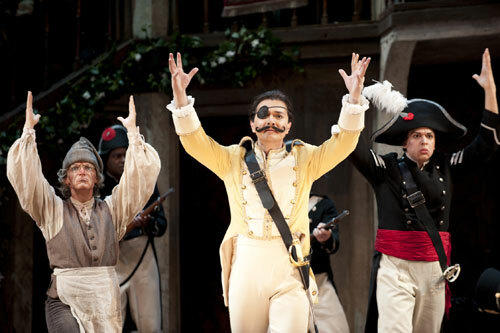 David S. Hogan (Ambrogio), Nicholas Phan (Count Almaviva), and Adrian Rosas (Sergeant) in The Barber of Seville. On stage, you really appear like a brittle old man, but you’re this young, spry guy. What’s it like to be aged so intensely, and did you model your movements after anyone in particular? It is GREAT to be able to play someone who is nothing like me (old and grumpy!). Being able to create a convincing older character is an awesome achievement. My makeup artist, Shelby Adele Richardson, rocks, so I have to give her credit for at least half of the magic. And, we can't forget the fantastic wig (by Joyce Degenfelder) and the Costume Shop, especially Heidi Zamora. To answer your question, I can't say I modeled my physicality after anyone in particular. In the beginning of rehearsal, I started to incorporate the mouth frown, but it took me a few weeks to discover or develop the rest of Ambrogio's body. As I continued to play and experiment, I landed upon a slight slouch, shuffling feet, back pain, and (so I've been told) Martin Short/Ed Grimsley elbows. Ambrogio's physical movements came to life with help from Peter, our director, and Rosa Mercedes, our choreographer. You don’t technically sing or speak in this role (aside from a few grunts), but I've noticed you mouthing a few lines when the entire cast is singing—what’s happening there? As you know, Mr. Jenkins comes to some rehearsals. We chatted after rehearsal, and he suggested that I lip sync during the Act I finale. I took his note to heart, at least half of it. Because I am an "actor" I have to justify EVERY choice I make on that stage, I decided that Ambrogio has enough wits about him by this point in the story—he was drugged earlier by Figaro, after all—to mouth along when the police comes to the door (because he is so startled), and when we all come downstage, hand in hand, in a kind of Act I climax (because he is so excited). 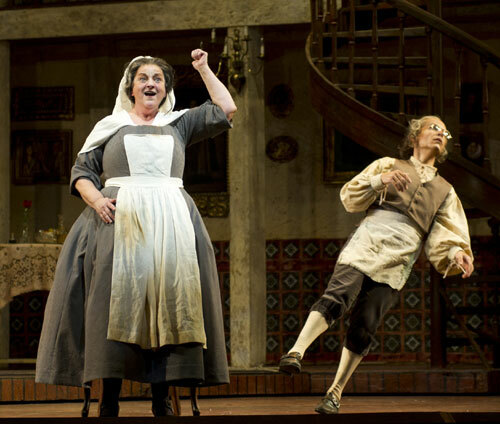 Sally Wolf (Berta) and David S. Hogan (Ambrogio) share a moment in The Barber of Seville. What’s next for you on your schedule? Well, I have had a good run lately. But after a fruitful 2010 with four productions, and a nice start to 2011, I have nothing lined up. I am auditioning, of course, but nothing in the books. I have spent the past three summers working with Seattle Shakespeare Company's outdoor outfit, Wooden O, so maybe I will land a role in one of their shows. But aside from hustling for the next acting gig, I am always busy running my dog walking and dog training company. Great idea to use Ambrosio the way Peter did and Hogan played it!! Try to work him in to a few more productions; he was a HUGE plus in Barbiere! !